"The work of Father Percy is a great resource to help alleviate the problem .Father Percy does us the great favor of including in his book a review of declarations of the successive popes since Leo XIII." "This is a book for which many have been waiting. It undermines stereotypes of Catholic thought about free enterprise and business while simultaneously challenging us to root entrepreneurship in a richer and deeper understanding of the human person. Anthony G. Percy brings together good theology, good philosophy, sound economics, and an appreciation for the full complexity of Catholicism's positive view of the entrepreneur." "In Entrepreneurship in the Catholic Tradition, Anthony G. Percy provides us with a detailed study of the distinctive contribution to the modern understanding of entrepreneurship developed by Catholic theologians, philosophers, saints, popes, clergy, and economists over the centuries. This book is a treasure of information and provides many useful correctives to much received wisdom on the history of entrepreneurship." 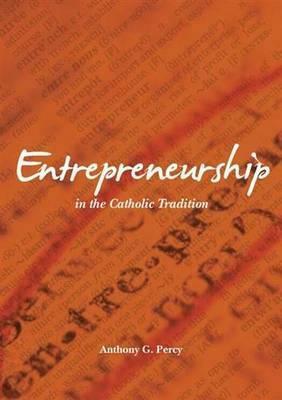 Entrepreneurship in the Catholic Tradition is a theological and historical exploration of the treatment of entrepreneurship, business, and commerce in the teaching of the Roman Catholic Church. Moving from Scriptural exegesis to modern papal social encyclicals, Anthony G. Percy shows how Catholic teaching had developed profound insights into the ultimate meaning of entrepreneurship and commerce and invested it with theological, philosophical, and economic meaning that surpasses many conventional religious and secular interpretations. Entrepreneurship is illustrated as being as much a potential contributor to all-round integral human flourishing as it is to economic growth and development. In this sense, Entrepreneurship in the Catholic Tradition challenges the stereotype of the Catholic Church having a negative view of economic liberty and the institutions that enhance its productivity. Instead we discover a tradition in which first millennium theologians, medieval scholastics, and modern Catholic thinkers have thought seriously and at length about the character of free enterprise and its moral and commercial significance.